Watchable thriller, enlivened by atmospheric direction and strong performances from Wahlberg, Crowe, Zeta-Jones and newcomer Alona Tal, though there's a frustrating lack of depth to the script, so it never quite manages to exert an emotional grip. Directed by Allen Hughes (one half of the Hughes Brothers), Broken City begins with New York cop Billy Taggart being cleared of the murder of a suspect, partly due to Mayor Hostetler (Russell Crowe) hushing up some crucial evidence. Seven years later, Taggart is now an ex-cop, trying to make ends meet as a private eye, accompanied by his loyal assistant Katy Bradshaw (Alona Tal). When Mayor Hostetler calls out of the blue and asks him to shadow his wife Cathleen (Catherine Zeta-Jones), Taggart accepts, but he soon uncovers evidence of much darker activity surrounding the Mayor's re-election campaign and decides to keep digging, whatever the cost. At the same time, Taggart has his hands full on the home front with his actress girlfriend's (Natalie Martinez) decision to star in an ‘artistic’ indie movie. Wahlberg specialises in blue collar tough guys (with sensitive streaks) and he's on fine form here as Taggart. Crowe is clearly having a whale of a time as Mayor Hostetler, chewing scenery like it's going out of style, but it's the over-the-top nature of the performance that makes it work (think shouty Al Pacino). Zeta-Jones is equally good as slinky Mrs Hostetler and Natalie Martinez makes the most of her role as Natalie, but the supporting honours are roundly stolen by Alona Tal, who delivers a perky, quirky performance as Katy that is hugely enjoyable to watch; it's also oddly refreshing to see a male-female relationship that doesn't have a sexual element for once. Aside from the performances, the film's biggest strength is its look, courtesy of Ben Seresin's suitably noirish cinematography; much of the film takes place at night or at least feels like it does. In addition, Hughes clearly knows his broken city well and there's a strong sense of place throughout, mean streets and all. The main problem is that the script lacks emotional depth and struggles to make you care about any of the characters as a result. Similarly, the pacing drags in the middle section and there's a strong sense of over-familiarity in the story itself, complete with a twist you'll see coming a mile away. 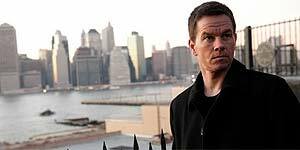 Broken City is a watchable, pleasingly old-fashioned neo-noir thriller enlivened by strong performances and atmospheric direction, but the script holds precious few surprises and it fails to connect on an emotional level.